Dean of Libraries/Vice President for Information Technology Services Pattie Orr. Photographed in Moody Memorial Library on May 9, 2017 by Carlye Thornton, BU Marketing Communications. When I sat down this past March with Dean of Libraries and Vice President for Information Technology Services Pattie Orr, we were in her office in Moody Memorial Library, surrounded by ten years’ worth of mementos both personal and professional. A construction helmet from the ceremonial groundbreaking for McLane Stadium. A print of a sheet music cover from the 19th century. Books written by or about Baylor luminaries. And on the table before us one of her ever-present cups of iced green tea, fresh and cold from the upstairs Starbucks location that she helped shepherd from idea to reality in 2011. The purpose of our visit was to document Dean Orr’s memories of the Digital Projects Group on the eve of her upcoming retirement. 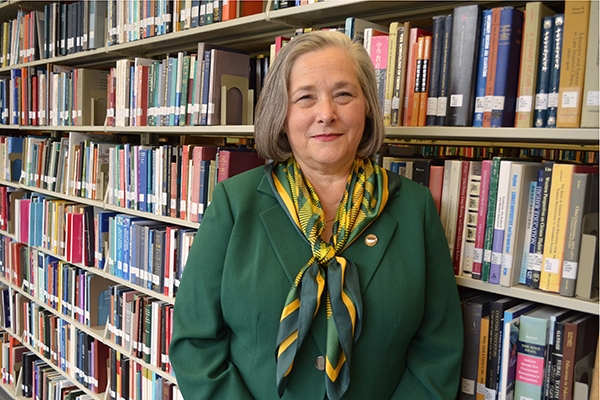 After a decade of service to the libraries and ITS, Dean Orr will retire from Baylor on May 31. Pattie likes to joke that she’s leaving at 5:00 PM on that day, but her husband Steve, who preceded her in retirement two years ago, likes to say it won’t be a moment longer than 5:00:01. Maybe that’s because he’s excited for her to join him in the post-workaday world, or maybe it’s because he knows she’s accomplished so many big things during her tenure that he’s afraid she’ll find one last thing to do – which could lead to another, and another and a further delaying of her well-deserved time off. Either way, you get the sense he’s not taking any chances, hence the very specific timestamp for her final day’s work as dean. 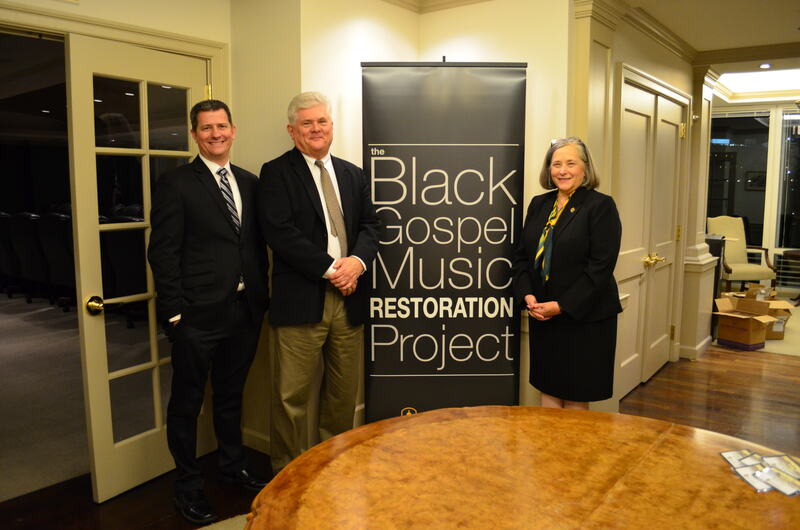 Darryl Stuhr (from left), Prof. Robert Darden and Pattie at an event in Washington, D.C. promoting the BGMRP, 2016. Prof. Darden would be one of Pattie’s earliest and most dedicated faculty supporters. I asked Dean Orr to relay her first memory of the DPG, the group that has grown under her leadership to oversee a digital collection of more than 400,000 items, a suite filled with sophisticated digitization equipment and a flagship project – the Black Gospel Music Restoration Project or BGMRP – that is now part of the Smithsonian Institution’s National Museum of African American History & Culture. And it seems fitting somehow that her first memory involves meeting the BGMRP’s patron saint, Robert Darden. “Bill Hair [interim dean, Pattie’s predecessor] and I were walking through the Goodpasture Concourse [in Moody Memorial Library] and Bob Darden was standing there, and Bill introduced me to him, and he told me what a great partner he was and how he’d worked so closely with all of you [in the Digital Projects Group],” Pattie told me. “He said Bob was one of our most supportive faculty and he turned out to be the very first faculty I met in the library. That hallway conversation would start a relationship between Dean Orr and Prof. Darden that would culminate in a nationally recognized effort to save imperiled recordings of America’s black gospel music heritage, a project that would find its way into the National Museum of African American History & Culture in Washington, D.C. I asked Pattie to recall her first meeting with the team that would become the Digital Projects Group – at the time, a team composed of Darryl Stuhr (now Associate Director for Special Projects), audio engineer Tony Tadey and myself. “My earliest memory of the Electronic Library digitization group in particular was in this room that became the Riley Center that had stacks of books and that y’all were in the dark, working on your scanning,” Pattie said. “And I just thought that was so interesting because I saw the Riley Reading Room [on Moody 2nd floor] and realized there was more to it than just that room, but my main vision of you all in the beginning was you all sitting in the dark, scanning, lights all off. Harold Riley would play a crucial role in the development of the Digital Projects Group, and Pattie’s visit in the summer of 2007 – along with then-director of development John Wilson – would pave the way toward Mr. Riley’s generous gift to fund the creation of the Ray I. Riley Digitization Center, named in honor of his father. Pattie said that while she hadn’t met Mr. Riley prior to their summer meeting, she had heard he was a man of great faith, so she asked us to put images from the BGMRP and other projects onto a laptop to show him the kind of work the DPG was doing in its current sub-optimal configuration – literally, in the dark, among stacks of books in an underutilized space called the Scholars Room. 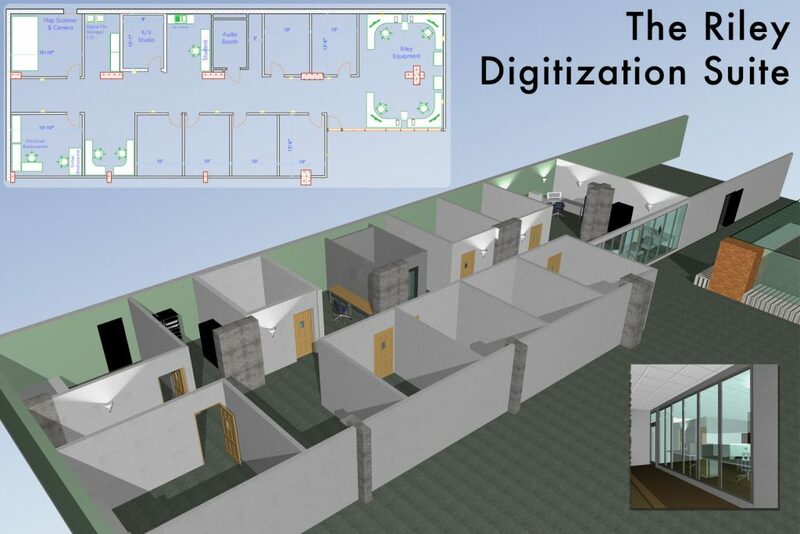 Those five words sparked a flurry of planning and dreaming on the part of the Electronic Library, particularly with Darryl as he worked to create an outline of what the Riley Center could look like if it were to serve the needs of the DPG for decades to come. Pattie returned to Mr. Riley with a plan to house current and future DPG employees and their necessary work spaces and specialized equipment in one central location: the space that would become the Riley Center. “I’ve been really proud of that space. I think it was well-planned by the group. You all did the thinking power behind how that space could work,” Pattie said. Pattie’s second major memory of the pre-Riley Center digitization space was the day the team and Dean Orr spent with our dear friend, the late Lev H. Prichard III. When Mr. and Mrs. Prichard read a story in their local newspaper, written by Professor Robert Darden, lamenting the scarcity of America’s recordings of black gospel music. A black gospel music collector and fan, Mr. Prichard and his wife Ella Prichard became interested in finding ways to work with Baylor to address the problem. Lev and Ella got connected with Dean Pattie Orr and a visit to the digitization center was arranged. After a tour of the Riley Digitization Center and meetings with Electronic Library staff, Mr. Prichard spent the balance of the day with Darryl, Tony and myself listening to recordings of black gospel songs and generally being overwhelmed with the power and potential of the project. It would come to pass that this visit would be Mr. Prichard’s last to the campus that he loved so dearly and supported so strongly; he passed away in 2009 . And it would be one that would prove incredibly important in the life of the BGMRP, as it eventually led to the creation of the Lev H. Prichard III Black Sacred Music Endowed Fund, an important source of revenue that helps us continue the work of the BGMRP. The Prichard family’s generosity toward the libraries would take form in two other ways under Pattie’s watch, as well. Lev’s Gathering Place, a beautifully furnished space in the Crouch Fine Arts Library, was created to showcase items from the BGMRP and to provide listening stations where students, faculty and visitors could listen to gospel tunes year-round. In 1996, Lev and Ella established the Pruit Symposium, an annual gathering of researchers and scholars that examines contemporary issues through the “perspective of the Christian intellectual tradition.” In partnership with the College of Arts and Sciences, along with many other academic partners, the Pruit Symposium has focused for the past several years on the topic of black sacred music and its evolving place in African American culture, as well as the broader role of religion in American society. 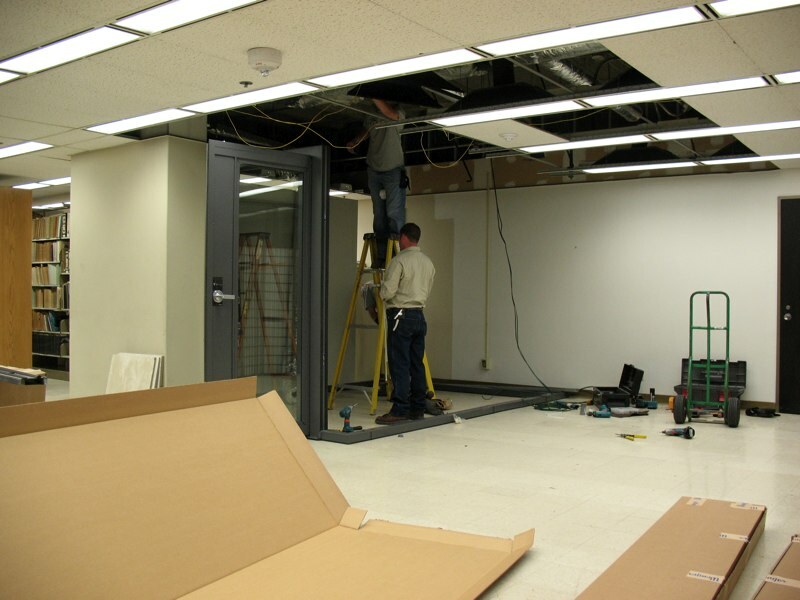 Workers install the sound isolation booth in the Scholars Room, an area that would become the Riley Digitization Center, in 2007. If it hasn’t become clear to this point, one of Pattie’s strongest skills is her ability to match a library need with an interested party in a fundraising version of the Match Game. I asked her if raising money was something specific she’d set out to do in her career in higher education administration or if it was something she found a natural talent for along the way. “If you really feel strongly about what you’re raising money for, it’s the easiest thing to do,” she told me. “I’ve raised money for very practical things – air conditioning in one case, bathrooms in another – a lot of things that aren’t necessarily exciting on their own. When we held the Regents’ Dinner in the space outside the Riley Center in 2008, right after the RDC opened, they [the Regents] could look around at the old furniture nearby from 1968 and they could see the need to upgrade and they said, ‘Oh, boy, there’s work to do’ to renovate the library. That made it easier to find donors to support that work. How Do I Love The(se Digitized Letters)? 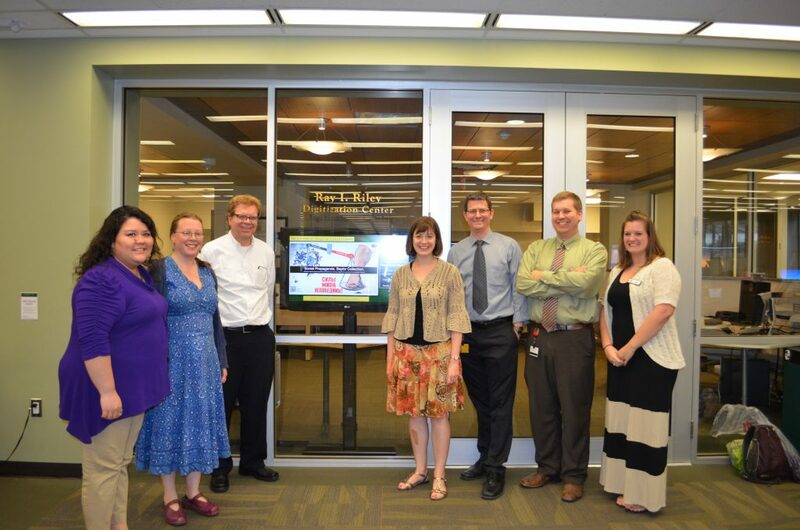 The members of the Browning Letters Project gather for a tour of the RDC (from left): Roberta Rodriquez (BU), Anna Sander (Balliol, Ofxord), Ian Graham (Wellesley), Fiona Godber (Balliol), Darryl Stuhr (BU), Eric Ames (BU) and Allyson Riley (BU) in 2014. It turned out to be a prophetic question, as Pattie was able to use her connections with Wellesley’s special collections librarians to help facilitate what she calls “the personal project I most wanted to see become complete”: the Browning Letters Project. In partnership with Wellesley and other holding institutions including Oxford and the University of Texas at Austin, Pattie and the staff at the ABL partnered with us to create a joint digitization project that unified Robert and Elizabeth’s written correspondence under one asset management system for the first time ever. That meant more than 4,880 (and counting) letters related to the Brownings were accessible in one site to researchers all over the world, but Pattie was most excited about the impact it could have on undergraduate scholars. Who Knew the Cruse Was So Versatile? One of my favorite moments in our discussion came when I asked Pattie if she had a favorite piece of digitization equipment in the RDC. Her answer surprised me: the Cruse CS-285 large format scanner, or as she’s called it from day one, “Papa Bear.” Most people go with a flashier option like the KIRTAS APT-2900 automatic page turning book imager, but Pattie’s description of the Cruse revealed her fascination with the mammoth German import. “I mean, it’s a hammer, a Swiss army knife, a shoe polish, a dessert topping – there are so many unexpected uses for this machine!” Pattie said with a laugh. And she’s right: over the years, the Cruse has been used to digitize newspapers, panoramic photographs, student artwork, the official portraits of all the Baylor presidents, architectural blueprints and more. It certainly finds new ways to be useful each and every semester, though none of us have tried it on ice cream (yet). I mean, it’s a hammer, a Swiss army knife, a shoe polish, a dessert topping – there are so many unexpected uses for this machine! Pattie (far right) surprised the DPG during a photo shoot in 2012. 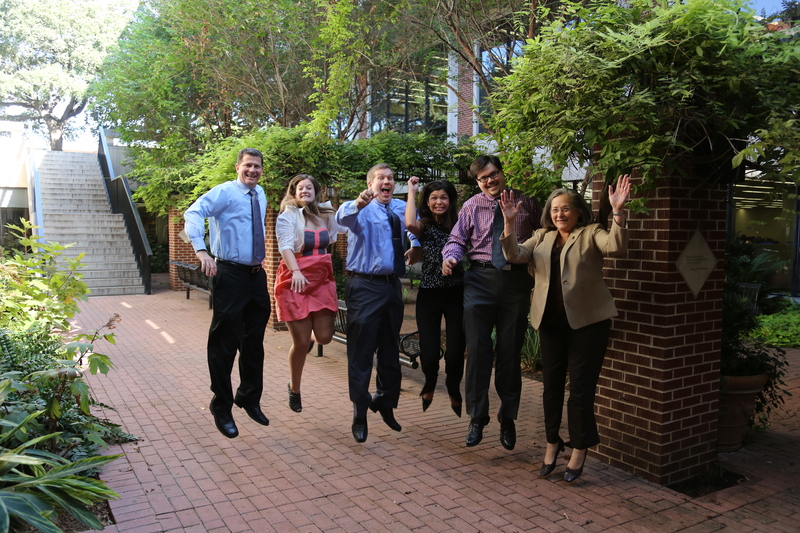 She suggested we do a “jumping shot” with her and the result became legend. From left, Darryl Stuhr, Allyson Riley, Eric Ames, Austin Schneider and Stephen Bolech join in the fun. We wrapped up our conversation with a discussion of where Pattie would like to see the DPG in the next five to ten years. She expressed her excitement at seeing how the projects we undertake touch the lives of people in unexpected ways. “My first teaching job after school was with the Texas School for the Blind in Austin,” Pattie said. “So it was a nice surprise to find that the DPG was able to use its scanners to help vision-impaired students through OALA.” OALA is our Office of Access and Learning Accommodation, and for many years the RDC has used its high-speed book imager to create digital versions of textbooks and course materials for students with visual impairments to access on book readers and other devices. Prior to our help, OALA staff members had to laboriously unbind and scan books one page at a time on a flatbed, a process that could take hours for a single book. Now, we can turn around a fully digitized textbook – sometimes upwards of 700 pages long – as a PDF in less than a day. Lastly, Pattie hopes to see us further expand the Black Gospel Music Restoration Project and its related materials, most notably the nascent Black Preaching Project. As the BGMRP gets larger and more recognition nationwide, we are expanding our collections into preserving the sermons of African American preachers, starting with the Rev. Clay Evans of Chicago, whose recorded sermons will be online in the coming months. Other projects include a “piano bench” project under the guidance of ethnomusicologist and Baylor faculty member Horace Maxile that would focus on saving sheet music published by African American artists and publishers around the turn of the last century. And of course, there’s the dozens of programs and events like Voices & Vinyl and Visions of Rapture that promote and support the BGMRP. That’s high praise from someone who’s overseen a decade’s worth of incredible work from a talent staff of library and ITS professionals, and we’re honored to take it. We ended our conversation as so many of Pattie’s conversations end these days: right before she had to go into another meeting. There’s a steady stream of those nowadays as Pattie works to wrap up her final projects in the last months of her time on Baylor’s clock. But she shows no sign of riding quietly into the sunset. She told me she’s looking forward to transitioning from being the dean to being on the board of advisors for the library – “Now I can tell you what I really think!” she said with a laugh – and to attending the dozens of library events and faculty talks she rarely got to attend when she was dean/vice president. I suspect retirement will be kind to Pattie; with two young grandsons in town and an eager travel companion in her husband, Steve, what’s not to love? But it’s also equally likely that whoever takes the reins as Dean of Libraries in the coming years will have big shoes to fill, especially when it comes to her unwavering support for the DPG. Dean Pattie Orr will retire from Baylor University at the end of the day on May 31, 2017. This interview is a condensed version of an interview conducted on March 22. The DPG wishes to thank Pattie for her years of service to Baylor and her support of our work. 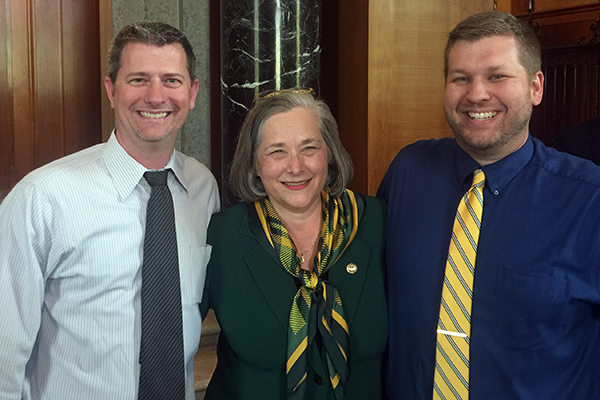 Enjoy your retirement, Dean Orr, and sic ’em! What a great interview and overview of what the DPG has been doing. Of course, I know these are not the only projects you have done and am grateful for the work you have done with the Poage Library to make many items from our collections available online for our researchers. Thank you, Pattie and the dedicated staff of the DPG! What a great legacy Dean Orr is leaving! The Baylor libraries were great when I was a student, and they are obviously better than ever. Congratulations on a job well done! Oh, Pattie. What a great journey this has been. You have accomplished so very much and the importance of some of these accomplishments will have an eternal and global impact. How many people can retire knowing that? I am so delighted that Bob and I have been part of your journey and we look forward to seeing you and Steve more often, now that you are retiring. You have more than earned this next stage of celebration. Excellent work, my friend!